Coming to an abandoned warehouse near you is the home ofToronto’s latest and greatest yearly Expo for Design, Innovation & Technology (EDIT). 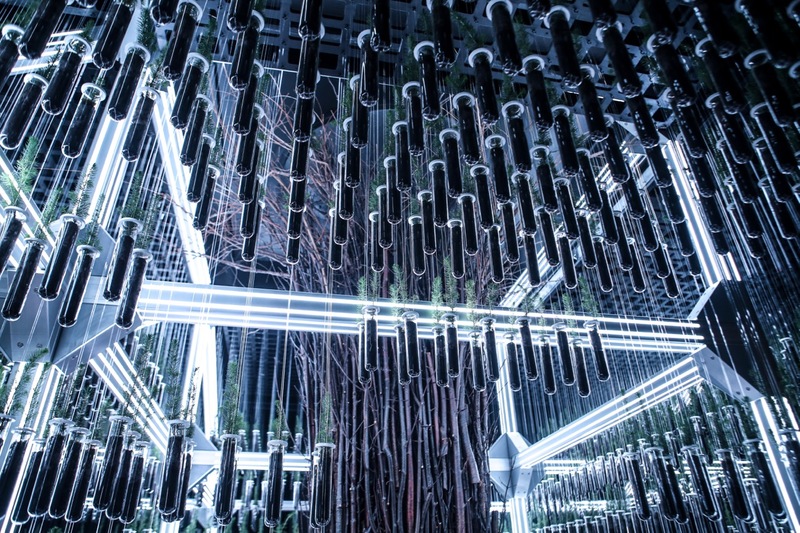 The “Festival of the Future,” kicked off it’s opening night with Pulse, an epic party that brought together over 1,000 curious minds to catch a sneak peak of 150,000 thousand square feet of installations and exhibitions focused on solving complex global issues through technology. While the launch party was full of fun, it’s the expo itself, running from Sept. 28-Oct. 8, that’s the star of the show. Broken up into thematic sections and divided by factory floors, the inaugural run of EDIT carries with it a message of sustainability through design. I got a glimpse at what’s on hand for visitors who decide to walk through the massive factory throughout the week. While everything EDIT has to offer is a must-see I’ve narrowed down the list to my top five most informative and immersive experiences. 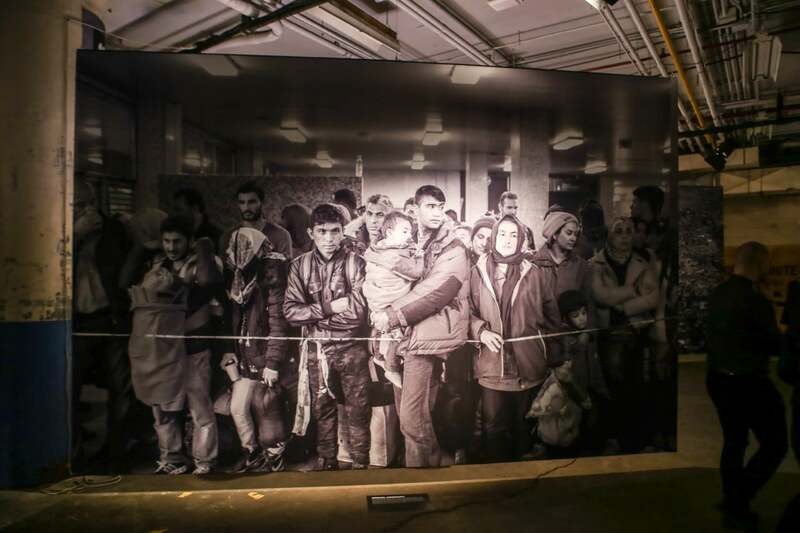 As part of the main exhibit “Prosperity For All,” This photo essay is one of the first things you’ll see when entering the EDIT factory. Acting as a sobering reminder of our global reality, Pellegrin’s work depicts the human aftermath when affected by forces out of our control. It was a very heavy start to the the event and one that shaped the rest of evening spent in the factory. Shown on a massive scale with large prints hung throughout the first floor, these photos certainly make for a big daunting first impression. From shooting the 2005 tsunami to the devastating 2010 earthquake in Haiti, Pellegrin has seen it all. This giant installation found on the second floor of the factory could be something straight out of Blade Runner. But what the team over at the Montreal based architecture agency created is both realistic and remarkable. Giant transparent sacks hang at eye level, lit by florescent tubing below. Each vessel contains an algae based compound that converts carbon dioxide into oxygen, scrubbing the area clean. Tubing attached to the bottom then releases the oxygen into the area, providing a simple way to provide fresh and clean air into potential living spaces. With it’s clean design and simple but intriguing premise, I found Scrubber to be the standout of the entire event. Full of dazzling lights and hundred of dangling trees, the Great Gulf instillation was pure wonder. 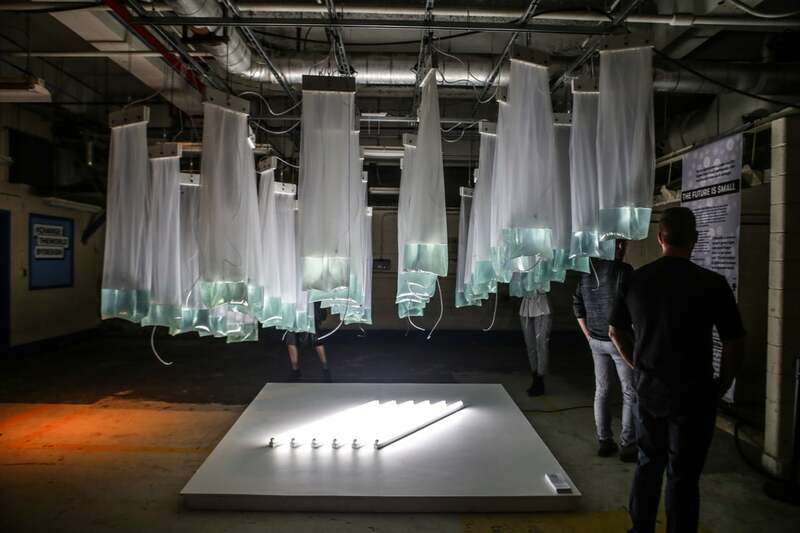 Located on the second floor of the former Unilever Soap factory, this installation is all about bringing it back to the basics and helping us rethink how we build our homes. Combining new technologies with natural resources Great Gulf aims to increase the sustainability of our structures while minimizing the carbon footprint. Not only does Great Gulf plant four trees for every one that it uses in production, but you were able to dedicate one of the newly planted trees in your name and leave a message with it as well. 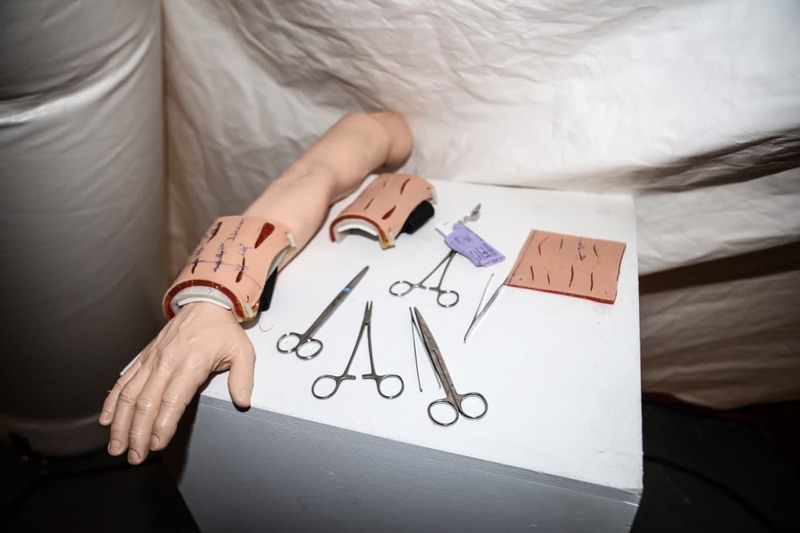 Tucked away under a medical tent is the Victoria Hand Project. Responsible for providing low-cost 3D created prosthetics to amputees all over the world, this west coast Canadian initiative trains local medical staff on how to use the technology. Currently providing workshops and service in five countries including Nepal and Egypt, The Victoria Hand Project marries design innovation with medical know-how, to provide solutions to communities often left without answers. Despite not being as flashy as some of the other exhibits, to me this project in particular felt important and worthy of festival goers time. On the first floor of the EDIT festival sits a a virtual reality exhibit. There’s a second one on the third floor on behalf of OCAD and it’s certainly interesting. 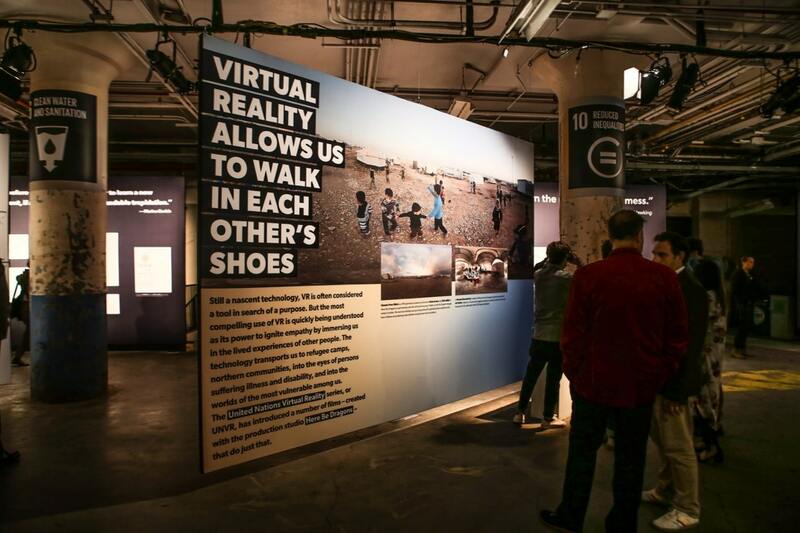 But on the “Prosperity for All,” floor, this specific VR exhibit in connection with the United Nations virtual reality series, allows you to experience the life of someone living in a third world country. Long connected to video games, this exhibit shows just what VR is capable of, extending far beyond surface level entertainment. It was a very strange experience, putting a hardware over my eyes and instantly being transported to a different place, all the while people were milling about.